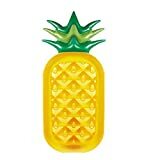 Back: Custom Shrunken Head - Have Your Own Head Shrunk! 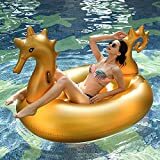 The next best thing to flying around on a real dragon and instructing it to incinerate all your enemies with its fire breath is maybe floating around in the pool all day on this cool new Golden Dragon Pool Float. 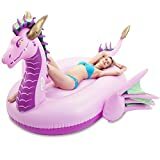 This fearsome and massive 103 inch long inflatable dragon for the swimming pool, beach, or anywhere it desires to go provides enough room for two riders, has two handles on the neck just in case it takes flight, and is constructed from heavy duty vinyl instead of traditional reptilian dragon scales. If this monstrous pool float agrees to let you ride upon it, you most certainly will rule the pool that day.